Now you know a puppy is going to be joining your family. What do you need to do to prepare? Here are some things you will need to have that very first night. You will need a crate that the puppy can stand up and turn around in. A crate is one of the pet carriers used to transport dogs on the plane. You see them in pet shops. The crate must be big enough but not too big. 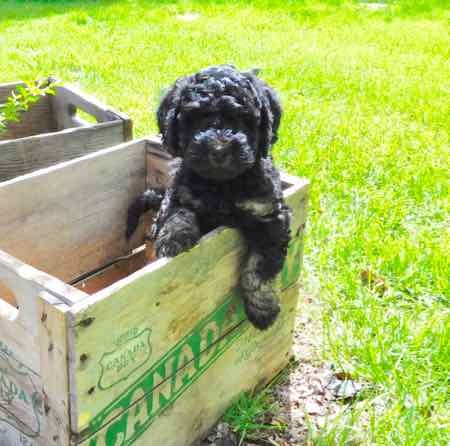 Buying a crate with room to grow isn’t a good idea because puppy will create a bathroom area in the rear. A Labradoodle puppy from us has been introduced to sleeping in a crate. Many puppies find it a safe refuge and a great sleeping spot. Some puppies just don’t like it much. 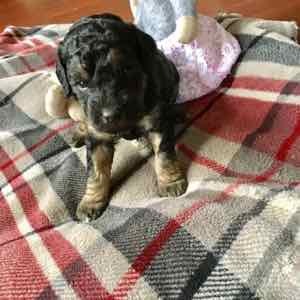 We will let you know about your puppy when she is ready to come home. A crate might not look as adorable as the pink fluffy bed with princess embroidery but to your new puppy her crate can be the equivalent of having a room of her own. When you want your puppy to be safe while you spend a couple of hours shopping, or your puppy needs to nap the crate is a good place for puppy to be. If you are going to leave puppy for an extended daytime period a pen is a better choice than a crate. Puppy can go to the bathroom, have a drink and chew toys in a pen. It also means puppy won’t be sick of the crate when bed time rolls around. Our puppies have been introduced to a crate. If you use your crate as a sleeping and napping space at home their crate becomes their own space. We have them spending the night in a crate before they go home to you. Our puppies often fly to their new homes and they are always welcomed by airlines because they are used to their crates. Can you imagine the trauma puppies who are not crate trained experience when they are put into a strange box and taken away from home? To our puppies the crate is their own little place and they are comfortable there. If your puppy arrives and tells you she no longer likes her crate put it where she can see you. Put her in it for short periods of time for naps. With a new environment she can be feeling strange but she will come round as all of our puppies nap and travel in crates. Even if your plan is that Fluffy should sleep in the bed with you, her time spent in her crate will help with potty training. Unless she has been in the crate an extraordinarily long time she won’t go to the bathroom in it. When nap-time is over take her quickly outside and she will go to the bathroom in the appropriate spot. Without her crate she will wake up on her frilly pink cushion, take a few steps and pee in the dining room. If she falls happily asleep at your feet or on a cushion just watch and be mindful. The minute she wakes up she will need to pee. You will both get in to a rhythm that suits you. We have introduced your puppy to appropriate places to go potty but puppy is still a baby. They cannot be said to be ‘potty trained’ when they go to their homes. They are far too young and bladder and brain are not properly connected. The one who is trained in the early days is puppy’s person to watch for the cues. Puppies like to be near you. A soft bed in the kitchen and any other room where you spend time is a great idea for puppy. Puppies will drag their toys and chewies over to this spot and it is where they are close but not right under foot. We have them in the kitchen, where we are on the computer and where we watch TV. Puppies chew. It is a fact of life. We have big smoked bones and lots of other chew toys available. Like little children they like variety. Rather than scolding him for chewing the chair rung or the woodwork offer him something even better. Ours like kongs with peanut butter inside. All kinds of dental chews. A warning though, things with bright green or red dye are never good! A crate. We like a wire crate for the car and we have a travel crate for seeping. It really isn’t necessary to have a special travel crate. If you are coming to us to pick up puppy remember to bring a water dish for the car and a chew toy for the crate. That first night your puppy will just be glad to be home. He will beg you for a big, gigantic meal! Feed him very little as his tummy will be easily upset. His little system will take a while to adjust to new water, new surroundings, even new little organisms in the dirt in his new backyard. Have a tin of plain pumpkin on hand should he have some diarrhea. A big scoop of pumpkin with some kibble will help the problem. Even if you should see a little blood when he goes to the bathroom don’t panic. That is irritation from the diarrhea. Give the problem a couple of days before you fly to the vet. Make sure your puppy is drinking lots of water. We used to give Pepto Bismal for upset tummies but they have changed the formula and it is no longer safe for dogs. Your Over The Moon puppy will have had his first vaccination that will begin to protect the puppy from the most common dog illnesses. However, he is not completely protected. Your puppy will have a record telling you when his next our of a series of three vaccines should be. We used to be able to give two vaccinations but veterinary medicine has changed its protocol and does not administer the first vaccine until eight weeks. Your puppy is completely protected two weeks after her third vaccine. That is the day she can walk in the park! Until that time she can’t go out on the ground in a public place. She can go to friends’ gardens, a puppy group where every puppy has a proven vaccine record, but not on the street or to the park or by the roadside on your way home. That being said puppy should meet as many people and go to as many noisy places as possible. Take her to sports events, to school and to all the places you go. Puppies should get used to the car even if they are not going anywhere special. However, they tend to want to leap out every time you do. This can lead to a terrible accident. Secure your puppy in a crate before you get out of the car. Be very careful when you are driving your new puppy home for the first time because everything is strange to her. Puppies love to play. Invite a puppy to your house for some puppy play but take off their collars. Accidents can happen with little mouths and little collars. Puppies are babies who put absolutely everything into their mouths from passing bugs to live electrical wires. I find I need to be in the same room as a puppy unless he is confined. When we need some ‘down time’ and I don’t want to put him in his crate I have a metal exercise pen from the pet shop. A little water, five chew toys and a mat makes a nice little spot where he can be while I am not paying attention. When I do work around the house I just have appropriate chew toys in every room and keep on encouraging their use. Mercifully, young puppies sleep a lot. A puppy lives to eat! Although an older dog might be a picky eater a puppy always behaves as if he is starving. 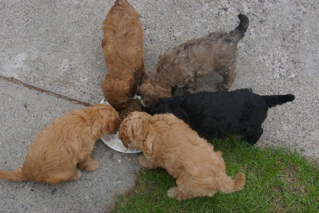 Choosing the right food for your puppy is important and we have found all those little kibbles look pretty much alike. The dog foods we are familiar with are the brands we see on TV. It is sold in the supermarkets and these foods are generally poor quality. All of the money that goes into advertised brands must go into the advertising, it certainly it doesn’t go into the food ingredients. We are now feeding various very high quality foods made by Orijen, Acana and Go. 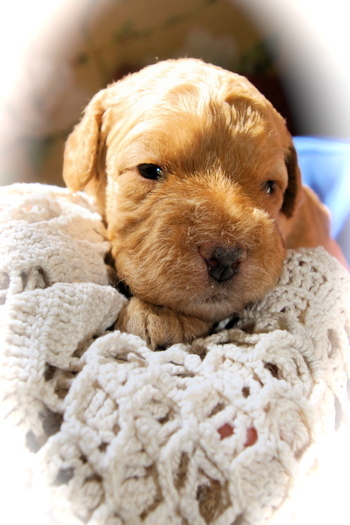 We will send home a sample of exactly what we are feeding your puppy. Puppies have sensitive tummies so she might need to be weaned from one food to another if the food she is on is not available. We do not feed puppy food. The best way to find a new food is to go to Dog Food Analysis. This is a site run by food scientists. It will give you a chemical breakdown of the food and it will rate the food according to nutrition. After you have checked out the site go to a local pet store and ask them which nutritious, well rated food they have available. Good dog food is not cheap but it is a lot less expensive than the vet bills will be a few years down the road with a poor quality food. Some foods are the equivalent of feeding your children hot dogs every night. We humans like to dine together. I used to love to see the little food bowls of our multiple dog household all lined up in the kitchen. However, the doggies would sniff at their own dish and the cruise everybody else’s dish and many times nobody would actually eat much of anything. If puppy is joining other dogs in your house feed them in separate rooms or feed the puppy in her crate. It is a good thing for humans to be around dogs when they eat but they are too intent on seeing who got something better to eat as a dog family. Liza's family having luncheon al fresco. In a few days all of their meals will be taken separately. Our puppies arrive wearing a collar. If you have your heart set on diamonds wait until Gigi arrives and take her into a pet shop to purchase a collar. She will need one that fits exactly right. Too large and she can easily back out of it if she is nervous or afraid. When she has that lovely collar make sure to check every few days as it is amazing how quickly puppies grow and you don’t want her collar to become uncomfortable. We like a harness or loopy for walking. A harness is a great investment for puppy because it will keep her safe while you are out in the world. You can’t slip out of a harness. Buy a good sturdy leash with a good clasp that will fit through the collar ring. Trainers do not recommend retractable leashes. Puppy needs to know exactly when he is at the end of the leash. When you are training your puppy you will want to have more control over the situation than you can have with a retractable leash. Once your puppy has been settled into your home it is time to continue with puppy training. Learn how to continue training at home, with kids and how best to care for your puppy.